Cas is a Chartered Physiotherapist and Craniosacral Therapist based in Avening near Tetbury in Gloucestershire. 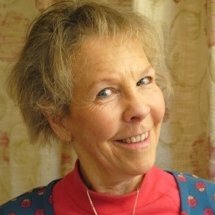 She has over 40 years experience, both in Kenya and for the last 30 years running her own practice in the UK. Along with 2 colleagues, she was a founding member of the Five Valleys Physiotherapy Clinic in Stroud. She is a registered practitioner of the method of spinal treatment pioneered by Sarah Keys (author of `The Back Sufferers Bible`). Cas is also qualified as a registered SIRPA (Stress Illness Recovery Practitioners’ Association) practitioner. This is a method for overcoming and managing chronic pain. She will tailor these various approaches to best treat your aches and pains. See further information on the Pain information page. In addition to treatment, Cas will seek to equip you for Self Help. Once you have been treated and recovered from a pain episode, you could help prevent another. Cas has developed a stretching routine called 4FIT, which is specifically designed to prevent pain and defy the aches and pains common with getting older. This is a 1-2 minute stretching routine to defy the ageing process and help prevent aches and pains.